Angispan TR 2.5 mg is easily available via online pharmacy, drug stores and medical supply stores. Angispan TR-2.5 mg is an effective drug to prevent and treat chest pain (angina). Angina is caused due to the narrowing of blood vessels that supply blood to the heart muscle. It is used in the form of sublingual capsules, sprays, patches and injections. The effect of this drug can be observed in an hour after oral administration.This time can be vary depending upon the route of administration.The effect can be observed within a minute in case of intravenous administration and can be observed in 30 to 60 minutes on topical application. The effect of this medication lasts for an average time of 12 hours on oral administration.Time duration will be vary depending upon the route of administration of medicine. Angispan TR- 2.5 mg is marketed globally by SIDMAK laboratories and is available at all the leading online pharmacy, drugstores and medical supply stores. Angispan TR 2.5mg is composed of glyceryl trinitrate. It should be noted that this medicine may be available in various strengths. 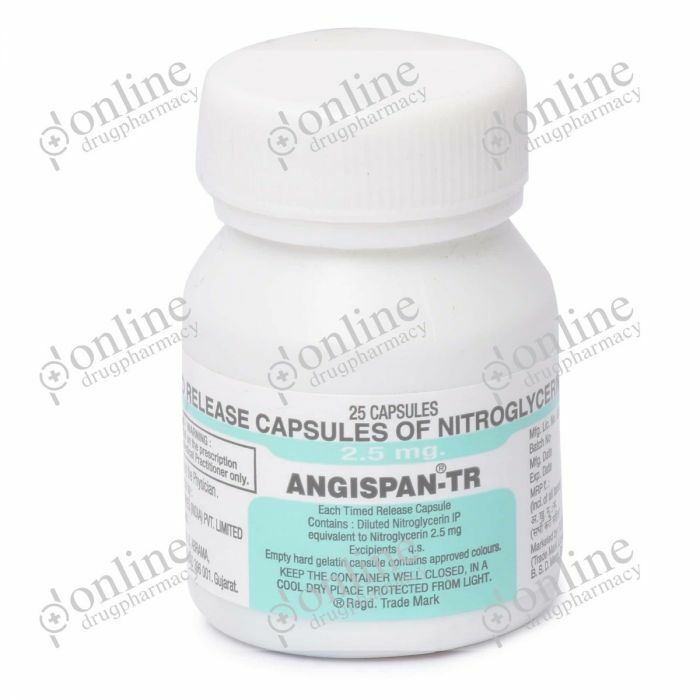 Angispan TR- 2.5 mg capsules are in the group of drugs called nitrates. It decreases the workload of the heart. So heart muscle does not need high blood and oxygen supply. Make sure you are not allergic to it. Confirm the dose required and instruction to take the Angispan TR capsules. Tell your doctor if you are allergic to Nitroglycerin . If you have anemia and recent heart attack. Vardenafil, sildenafil, avanafil and tadalafil. Inform your doctor and pharmacist about your drugs and health problems. Avoid use of alcohol while using this drug. Avoid smoking while using this drug. It is not recommended for pregnant women unless necessary. It is not recommended for breastfeeding women unless necessary. Consult your physician to enquire about the dose required for you. Take the dose prescribed by your physician. Take the medicine as prescribed. Swallow it as a whole with water, do not chew or crush the capsule. Use the drug for duration prescribed by your physician. Do not use more than the prescribed dose. Taking a high dose of medication will not improve symptoms, they may cause serious side-effects. Do not use extra dose to makeup for a missed dose. Given below is a list of possible side- effects that can occur from ingredients of Angispan TR-25 mg capsule (Nitroglycerine). These side-effects can occur but not occur in all cases. Inform your doctor about all the drugs, herbal supplements and vitamins you are having simultaneously with this drug, so that your doctor will be able to manage drug interactions. Pregnant women should avoid this drug. Lactating women should not use drug. Alcoholics should not use this drug. Smokers should avoid this drug. Do not pour drug into the drainage because drug discarded in this manner may contaminate the environment. Angispan 2.5 mg is indicated for use in the treatment of angina pectoris. The drug is available in the form of capsules and can be administered directly with water. Angispan TR- 2.5mg is available in the form of a capsule. Take medicine as prescribed by your physician. Consult your doctor for the recommended dose of Angispan.